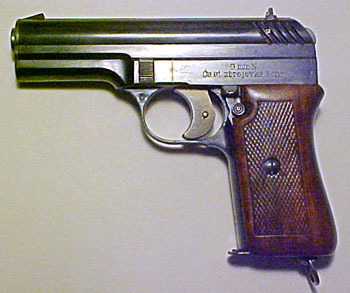 The Czech vz.22 pistol was manufactured by Zbrojovka Brno (the Brno Weapons Factory) between 1920 and 1923. 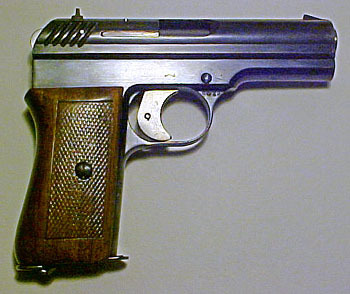 Though it was initially intended to be a production military pistol, it ultimately served as a mere prototype for the vz.24 which was manufactured by Ceska Zbrojovka (CZ). Josef Nickl was an Austrian engineer who began work for Mauser in 1904. Nickl was responsible for virtually all the pocket pistol research and production done at Mauser in the early 20th century. He designed the Model 1910 and the Model 1914, and participated in the design of most other Mauser pocket pistols through World War II. In 1915 Nickl designed a locked-breech pistol mechanism that utilized a rotating barrel quite similar to the 1912 Steyr-Hahn pistol and was built on the frame of the 1914 Mauser pocket pistol. Prototypes of this design were produced in .45 caliber ACP, 9mm Parabellum, 7.62mm Browning, and the experimental 9mm Nickl cartridge (basically a rimless version of the semi-rimmed .380 ACP). These prototypes all bear Mauser markings as well as the letter N to indicate that they were Nickl designs. Patents were taken out in various European countries, as well as the United States, but no version of the gun was ever produced commercially by Mauser. In October of 1918 Czechoslovakia declared its independence from the Austro-Hungarian Empire, and in 1919 took steps to establish an arms factory in Brno, which was initially staffed largely by Austrians and Hungarians because they had the requisite expertise in arms manufacture. The Czech Ministry of National Defense negotiated an agreement with Mauser to produce the Mauser Model 98 rifle at the Brno Arms Factory (Zbrojovka Brno). Machine tools for production of the rifle were purchased from Mauser, and a team of engineers and technicians was despatched to install the equipment and train Czech workers. This team was headed by Josef Nickl. Probably soon after he arrived Nickl became aware that the Czech Ministry of National Defense was anxious to develop a standard self-loading pistol for the Czech armed forces, and Nickl proffered his own design. The Brno factory delivered the first Czech-made prototypes of the Nickl design near the end of 1920, which were tested and deemed totally inadequate but, despite the inadequacies and cost overruns, work continued and the first production pistols were delivered in October of 1921. The gun was designated the vz.22. The pistols were tested, and in March of 1922 numerous modifications were requested, including a stronger barrel and slide, an external extractor, and changes to the sights, firing pin, and hammer. The slide had been designed to stay open on the last round, but for some reason the testers requested that the slide close when the magazine was removed (this was the way the Mauser Pocket Pistols worked). The modified pistols underwent further tests in 1923, and continued to be unreliable. The Zbrojovka Brno was having serious problems making identical parts. Guns often had to be tuned individually--then, of course, parts wouldn’t interchange between guns. The factory was preoccupied with rifle production and, though they continued producing the vz.22 pistol, they were probably tired of haggling over its design with the Ministry of Defense, so when they had fulfilled their contract they simply asserted that they couldn’t produce both rifles and pistols. They had delivered over 19,000 of the vz.22, though many of them were quite dissimilar and varied in reliability. In April of 1923 the newly formed Ceska Zbrojovka (CZ) company was was asked for a quote on 20,000 pistols. CZ’s price was high and they demanded exclusive rights to produce the pistol, but there were few alternatives, so in December of 1923 the Czech government issued them a contract for 20,000 pistols. Negotiations had to be held with Mauser and with Zbrojovka Brno over licensing of the design. Frantisek Myska (a design engineer who had worked at Praga Zbrojovka and later at Zbrojovka Brno) and other engineers, worked for nearly a year to simplify the manufacturing process for Nickl’s design, and adapt it to the machine tools available at the Ceska Zbrojovka factory in Strakonice. Due to the many changes introduced, the new CZ gun was designated the vz.24. The vz.22’s debt to the Mauser Pocket Pistol is obvious. The frame, rails, side plate, grips, trigger, and manual safety are almost identical. But the internal mechanism is quite different. Most sources state that the rotating barrel system was inspired by the 1912 Austrian Steyr-Hahn pistol, with which an Austrian design engineer such as Josef Nickl would have been quite familiar. 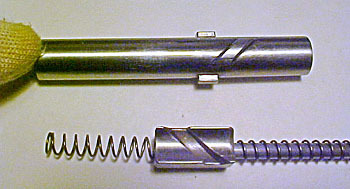 Rectangular lugs on the barrel of the vz.22 engage slots milled into the sides of the slide, and a helical lug on the bottom of the barrel engages a helical-cut groove in a block pinned to the upper frame. As the slide moves to the rear after a cartridge is fired, the helical groove in the block turns the bottom lug and rotates the barrel approximately 30°, disengaging the side lugs and allowing the slide to complete its recoil movement and eject the spent cartridge shell. The vz .22 utilizes an external hammer rather than the striker mechanism found in the Mauser Pocket Pistol. A number of commentators state that the locked breech mechanism of the vz.22 and vz.24 is an unnecessary complication. However, J.B. Wood points out that European loadings for the .380 cartridge are somethat hotter than those in the U.S., and the locked breech helps control recoil. Mauser Pistolen, by Weaver, Speed, & Schmid. Collector Grade Publications, Ontario: 2008. Troubleshooting Your Handgun, by J.B. Wood. Follett, Chicago: 1968.